Cat Bells is the classic short walk for anyone stopping at Keswick. It can be reached using the Keswick launches, which dock at several points along its eastern flank, the nearest being at Hawes End. Its popularity means that the limited parking space around the fell is often full very early, although the situation isn't so bad out of season. Cat Bells is rather more of a serious climb than some think. It may not be particularly high, but the parts of the path are steep and the final scramble up rock is getting more eroded each year. Good footwear is thus essential (although not universally worn). It is also worth remembering that the summit is narrow with big drops to the east and west, so not a good place for children to play! Having said that Cat Bells is still a classic short walk. The northern ridge offers a fairly easy route to the lovely summit, and the views are spectacular in just about every direction (the views due south are rather limited by Maiden Moor). The best part of the view is the full length view of Derwent Water which sits below the fell, and tends to attract most attention. The Helvellyn range can be seen away to the east, Skiddaw dominates the northern view and to the west and north-west the Newlands fells are impressive, but the lake keeps drawing one back. There are three ways up Cat Bells. The most popular starts at the northern end and follows the path along the ridge all the way to the summit. This is the best way up the fell, with great views as you go and a real feeling of accomplishment at the top. The summit can also be reached from Hause Gate in the south. Hause Gate can be reached from the east up a steep path that is now effectively a rocky stair case or from the west up a path from Little Town. The fell is covered with more direct paths up the flanks, but the use of these is discouraged at the moment in an attempt to prevent erosion. Our ascent of Cat Bells is part of a longer walk that continues on to High Spy before returning along the route of the Allerdale Ramble. Cat Bells has a small neat summit, once grassy but now eroded away to rock by countless feet. There are steep slopes to the west and east, with the steepest to the west, so the views into the Newlands Valley and down to Derwent Water are almost unobstructed. The only gentle slope drops away south to Hause Gate and from there on to Maiden Moor and High Spy. To the west Cat Bells is bordered by Newlands Beck, which flows north past the fell. Yewthwaite Gill marks the south-western boundary, flowing into Newlands Beck. To the north the situation is more confused, with a series of small backs and field drains that flow east into Derwent Water and west into Pow Beck. Pow Beck flows very close to Newlands Beck both pass Swinside (the wooded hill north of Cat Bells), but don't actually merge until they reach Rough Mire, almost on the shores of Bassenthwaite Lake, three miles to the north of Cat Bells! A number of nameless streams form at springs on the eastern slopes of Cat Bells and flow directly into Derwent Water. 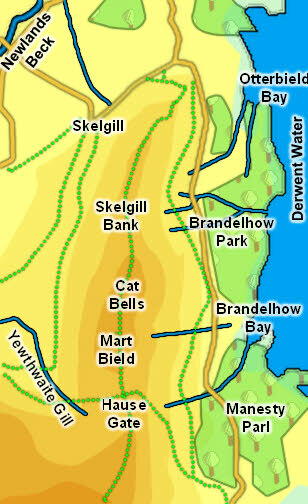 One of these forms the south-eastern boundary of the fell, flowing east a point below from Hause Gate then turning north-east to flow into the lake at Brandelhow Bay. Cat Bells has no tarns. Cat Bells was once the site of an active mining industry. The most visible signs of this are at the south-western corner where the levels and workings of Yewthwaite Mine can be seen, but there is also a disused level close to the Allerdale Ramble on the north-eastern side of the fell, part of the Old Brandley Mine. These levels are dangerous and shouldn't be explored.